Life has been busy! The weather finally warmed up too... yay! I have been making a lot of cheese lately - mainly mild feta, mozzarella (found/created a *good* recipe), ricotta (made with the mozz whey) and cream cheese. And it all gets devoured pretty quickly ;)! We haven't had any more kids born since Piglet's a few weeks ago. There are 4 does left to kid, the 1st one is a yearling doe due in about 2 weeks... not sure if she is bred or not. 2 weeks after her a mature Nubian doe ("Baby Ruth") is due and she is definitely pregnant ;). So are the other 2 due after her... very wide! We got a new truckload of hay in about a week and a half ago and it's new hay from this year - super nice!! 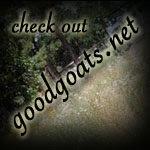 If you are looking for good hay, give us a call! I was looking thru pictures and found this one of Peppy, the baby llama, with somebody's glasses on him - goofy llama, LOL!! Since none of the does are really coming into heat anymore, all the bucks are turning white again instead of yellow. A couple have gained a few extra pounds. . . no worries though, they'll shed those extra pounds off come Fall when they aren't so lazy ;). The pasture is growing very well this year - very thankful for that. Right now there are about 40 ewes or so and 40 does, plus 2 llamas, a jenny and 2 cows out on the 40 acres and it's doing great. Still with all that I don't think they can keep up with the growth. And for those of you who may have wondered - we faired just fine through the storms that have battered this part of the country the past few weeks. We got some big hail and lots of rain, but no tornados. . . praise the Lord. There were some pretty close, but thankfully none came too close. definitely time for a post! I have seriously neglected this blog lately - sorry folks! Life has been busy. A week ago today, Piglet gave birth to triplets - 2 does and a buck. We had just finished milking and I heard some grunting coming from the stall, and sure enough a bubble was there! She had all three in a matter of less than 5 minutes, no problems at all. Way to go Ms. Piglet! Their sire is Quiet Wyatt, our polled buck, and at least 2 of the kids are polled, possibly all three. All the does are already spoken for, but not sure about the buck... he may be available. Friday we got another donkey. She's a mini (well, maybe not "technically mini", but she's small) jenny and is supposedly pregnant. 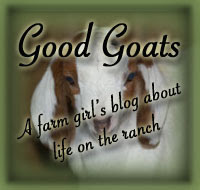 She was with 75 head of goats guarding them and she's doing great with our herd! This is one of the newest Painted Desert sheep rams... nice horns! There are 4 does left pregnant now - Friendly (alpine/nubian) due early June, Baby (nubian) due late June, Frenchie (miniNubian) due early July and Prissy (nubian...pictured below) due late July. And then we are done for the year (or, maybe till December)! But for now, we have a break till June 12th - yay!!! 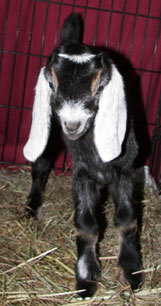 Baby Tic-Tac, the "tiny goat" is doing pretty good! He's growing but is still pretty small for being 5 1/2 weeks old now! He's so sweet tho. Have a good night! I've got to get to bed! 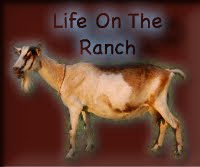 Life on the ranch is pretty calm right now, not a whole lot out of the ordinary (amazing, huh?!). The sun is shinning today and we've had a break from the rain the past few days. My grandparents from CA are visiting so we've been busy with that some. Here are some random photos from the past week. This little goat below is Annie. She was one of 4 Alpine/Nubian crosses that we got late last year (they are the ones that we banded/removed their horns - could never tell now!). Anyway, so they all had a little rough time with the move and everything we put them through, but were doing better. . . except for Annie. She had a run-in with worms, which she got over, and then about 3 weeks ago she came down with pneumonia bad. I had run out of Excenel, but my cousin's wife was kind enough to run up to the vet's office and get some for her. I started her on a 5 day Excenel treatment, along with other supportive things and Banamine. She could only stand for about a minute at the most and then she would start panting because it was so hard for her to breath. Poor thing, it was hard to watch. She still ate and drank though, and loved treats. After the 5 day treatment, she still was not looking any better. I decided as long as she would still eat and could stand some, we'll just wait it out. Well, a few days later she started improving, her breathing got completely better and she could stand without having any troubles. Now despite being a little thin, she is totally back to normal! Praise the Lord! I really didn't think she was going to make it through that pneumonia. About a week and a half ago my Mom and brother came home with a fainting goat. It's too funny, but I kind of feel sorry for the goat at the same time ;). This is Grandma Maggie. She's doing great!